This entry was posted on Wednesday, January 9th, 2008 at 10:54 pm	and is filed under Main Dishes. You can follow any responses to this entry through the RSS 2.0 feed. You can leave a response, or trackback from your own site. I’m sold! W/ corn salsa, bellos and adobo mayo, too? Too good! The burgers look moist and not dry that some bean burgers I’ve had. I’ve been cutting down on my meat intake, but have been dissatisfied with the store-bought vegetable burgers. As I’m a fan of all things beans and chipotle, I can’t wait to try these. I’ve been making bean burgers for a while now but I love that you added the chipotle pepper in adobo! I always have tons left over after making chili. 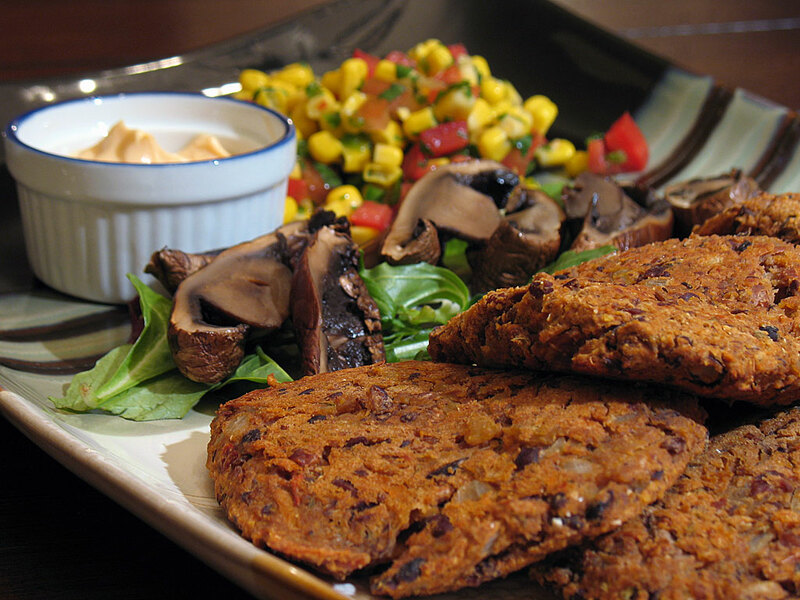 This is BY FAR the best bean burger recipe I have come across. Thank you! I made 3 minor changes: it makes 6 not 8, I add a little cilantro, and it’s better cooked in a pan than in the oven (gets less dried out).